With rising lease rates and a climbing cost of living, it’s no secret that Denver is feeling the pressure of rapid change and the growing pains that come along with it. 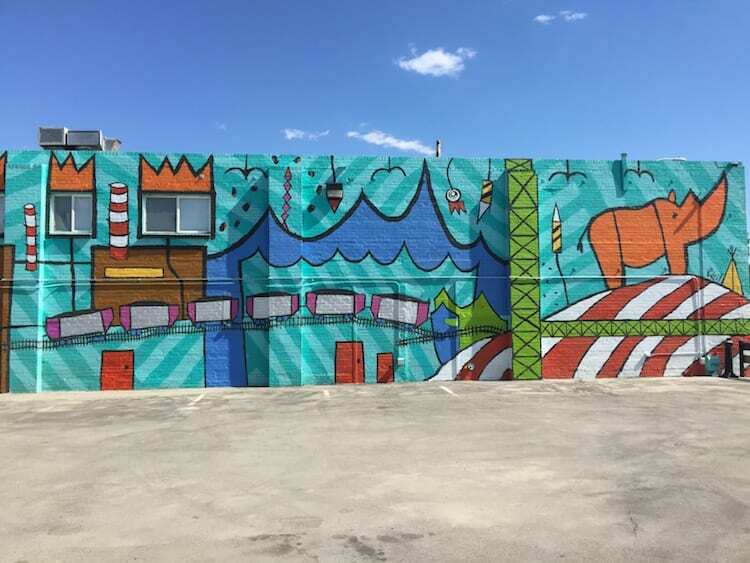 Seemingly at the top of the Denver “hot list” is the RiNo Art District, a state-certified creative district in northeast Denver made up of four historic neighborhoods: Five Points, Cole, Globeville and Elyria-Swansea. These neighborhoods are fighting an uphill battle against market forces that are impacting Denver as a whole, and while many cities and “hot” ’hoods everywhere are working to figure out solutions, the RiNo Art District is hoping to pilot a few of their own ideas in 2018. One of these ideas has been in the works for over two years and stemmed directly from community concern over how the rapid development could lead to disaster in the form of loss of the unique industrial character and the rapidly rising cost of living. 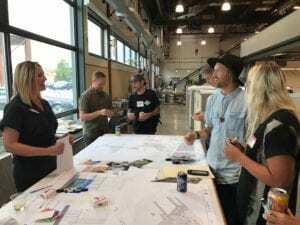 Through a variety of conversations with planners, architects, the city of Denver, City Council representation and the community, thus was born the marriage of a joint Design Guidelines and Design/Affordability Overlays that would work in concert to address the vast concerns impacting the neighborhoods within the RiNo Art District. Artists participate in a charrette at OZ Architecture to explore ideas for the new World Trade Center coming to RiNo in 2019. Design guidelines are not a new concept – often neighborhoods use them to dictate things such the aesthetics of new development. This, too, was important in RiNo, but the district sought to take the guidelines a bit further and give them teeth in order to address both character and affordability concerns in a quickly developing area. Realizing that the design guidelines are ultimately a strong suggestion laid out by a design review committee, the Art District chose to couple these with a design/affordability overlay written directly into the zoning code. • Mandates context-sensitive design that prioritizes ground-floor transparency and activation, then ties this activated space to commercial affordability requirements. Those ground-floor uses would then be prioritized for artist spaces and other community services deemed unable to meet market-rate rents. • Provides direction on how development engages with designated primary streets, as well as treating the Platt River as a primary street to be activated, and mandates how parking is treated. • Including uses in commercial developments that serve the community, such as day care, grocery and artist spaces. The designaffordability overlays were presented to City Council Feb. 12 and approved. This is the first time the Denver Zoning Code has included incentives for affordable housing..
• Build on RiNo’s distinctive character. • Encourage entrepreneurship and innovation. • Promote active pedestrian environments through building orientation to the street, frequency of building entries, transparency and active ground-floor uses. • Encourage the integration of ecosystems into private development, such as green or low-impact development stormwater management and/or wildlife habitat. 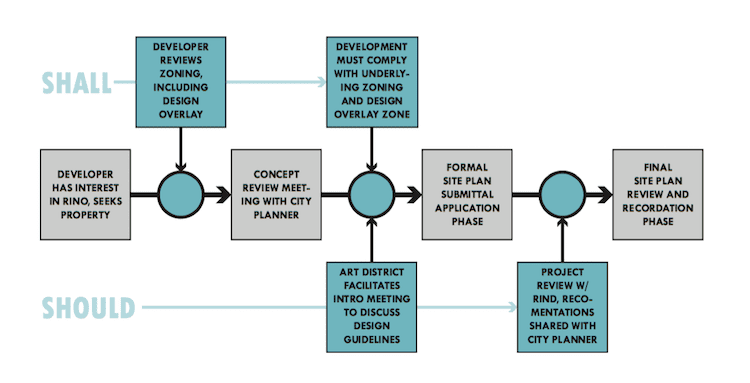 • Supplement the requirements of the zoning ordinance so as to reflect the unique character of the RiNo Art District. • Encourage site design, streetscape and building design that collaborates with local artists to create spaces or venues for their art. • Encourage projects to provide affordable live/work or studio spaces for artists. • Encourage developments to utilize the RiNo Art District resources for funding art or maker tenants for their projects. 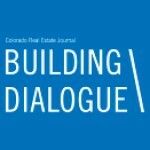 Alye Sharp, community engagement director of the RiNo Art District, wrote this article.